Internet users enjoy equal access to the bandwidth entering their Internet Service Provider (ISP). Bandwidth controls the total amount of information that can be transferred through your internet connection. Bigger Bandwidth equals faster internet. As of now, the internet doesn’t selectively restrict bandwidth speeds for websites. An article in CareerProfiles points out that “Internet service providers aren’t able to block content from competitors or delay the streaming speed of any site, in particular, meaning everything streams at relatively equal speeds”. 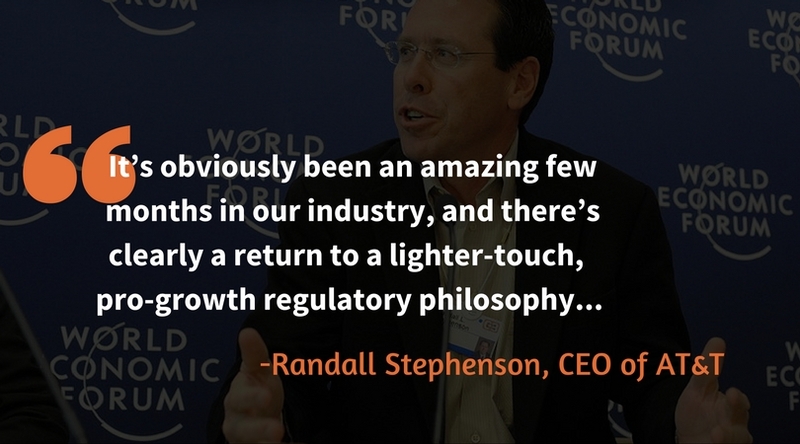 However, telecom giants like AT&T, Comcast, and Verizon want to change all that. The FCC had previously created three rules to protect Net Neutrality (Helene reviewed those rules in this week’s #MarketingMonday segment): these are known as the Open Internet rules and were passed in 2010 under the Obama administration. FCC rules also require broadband providers to be transparent, accurate, and truthful about their services. This is meant to empower the public to make informed choices – including choices about internet speed, price, and network management practices. The FCC routinely updates these reports. A smartphone app also allows you to test broadband speeds using publicly-available, free online tests and to test mobile broadband. Why is this in jeopardy? 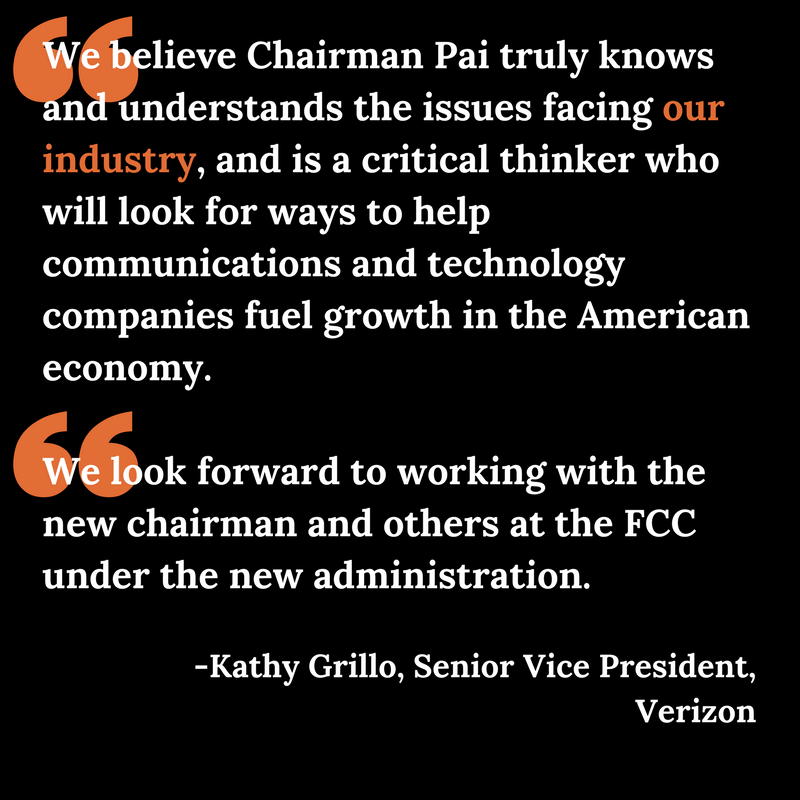 Ajit Pai, the new FCC chair (and an ex-Verizon lawyer), wants to lift Net Neutrality for service providers like Verizon. Pai argues that the 2015 regulations on net neutrality have hurt the telecom industry’s “investments” and “innovation” while also burdening small internet providers. 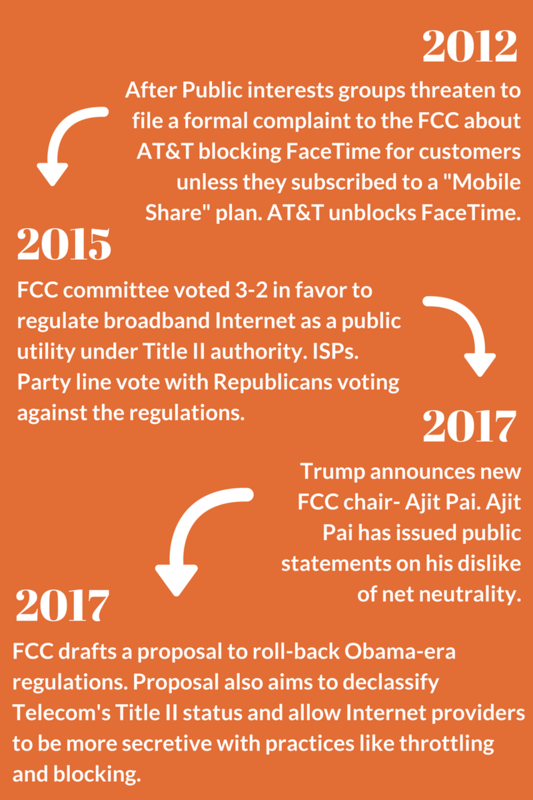 Telecom giants spent millions in DC lobbying for these regulations to be lifted, and it looks like it paid off (no pun intended). The FCC’s new proposal, ironically named “Restoring Internet Freedom“, not only questions the legality of the Open Internet but also if it’s needed in the first place. The bill will loosen ISP’s Title II constraints, which will allow providers to control the quality of their internet service. Under Title II the internet is classified as a public utility similar to water, gas, and electric. Utilities are something everyone needs. When we turn on our water, we expect clean quality water regardless of how much we pay for it. Proponents of the Restoring Internet Freedom bill argue that ISPs should be able to provide their service however they see fit. But if money begins to speak louder than content, much of the voices online will be shut out. 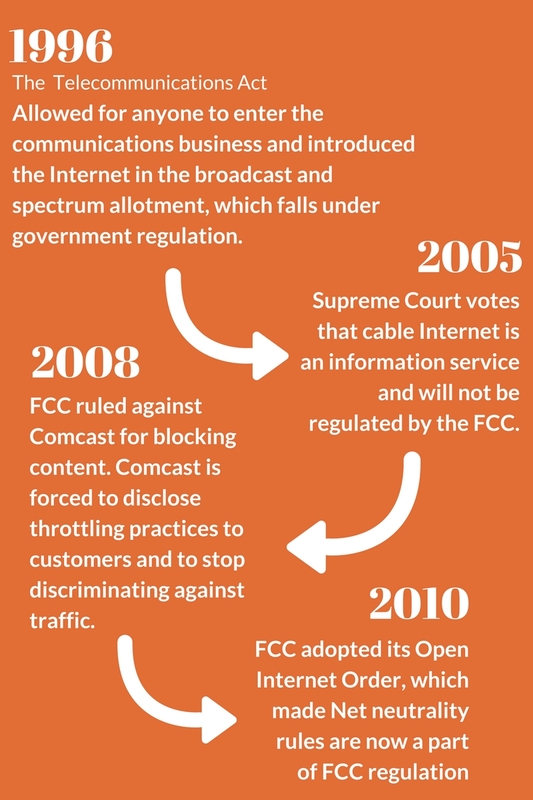 This change will impact the very idea of the internet and create large monopolies of internet providers unresponsive to their consumers, which is akin to modern day cable. If you will, imagine with us: a future Internet–a dark and sad internet–where a couple large ISPs reign supreme. Corporate monoliths like Comcast and AT&T could run the internet like they do currently with their phone service: lousy. For example, Comcast will have the legal authority to prolong the downloading speed of Netflix, their competitor. AT&T, a competitor of Disney, could require a paid subscription to view content from ESPN. NBC (who owns Hulu) could give preferential treatment to the Handmaid’s Tail and could slow down the downloading speed of Netflix’s Orange is the New Black. Please don’t take away Orange is the New Black! Internet access could look a lot like subscription based cable packages. The Gold package gets you Google. The Bronze package gets you AskJeeves. Advocates of Pai argue that large networks can create filters and large scale echo chambers of approved content. Since many proponents of the rollback on net neutrality are cable providers, how does all of this affect small business (or businesses with a smaller budget)? A business’s budget closely coincides with its bottom line: small businesses and entrepreneurs will have fewer resources for a marketing budget compared to their multi-billion dollar corporate counterparts. This inequality will be exacerbated when larger firms simply pay for “fast lane” streaming speeds on the internet. And although streaming speed doesn’t sound like a big deal, consider that 40% of people leave a website if it takes longer than 3 seconds to load. Harry Shum, a computer scientist and speed specialist at Microsoft, describes this user impatience to the New York Times – “Two hundred fifty milliseconds, either slower or faster, is close to the magic number now for competitive advantage on the Web.” So when fast internet revolves around the dollar, how will people with less compete? Digital marketers should also keep in mind the importance of organic reach in a search engine landscape. SEO is extremely important as of today. But what if search engines no longer prize the content of a website above all else? A major shift in digital marketing strategy could occur. When ISPs begin charging more for internet speeds and access, marketing strategies will evolve to out-pricing your opponent instead of providing a better service. Creativity will be replaced by bidding wars. Companies will pay top dollar to gain access to users over the internet. The tech firms that can’t afford maximum speed will toil to compete. In this society, where money grants tremendous privilege, can the internet remain a neutral playing field? The May 18th move from the FCC was just to issue a proposal for public comment, which is an initial stage required in FCC rulemaking. The FCC has already received over 1 million comments since Pai issued a draft of the proposal that same week. Pai requested “fair” and “honest” public feedback although hi story shows us that advocates of Net Neutrality tend to be of suspicious origins. The new proposal may easily pass within the three-member commission. Pai and Michael O’Reilly agree with a Net Neutrality over-haul. However, not all is lost. First, activism: Nothing gets a conversation going more than activism. Raising awareness is the first step in getting people involved. Secondly, visit the FCC website to leave a comment regarding your grievances (or praise). The committee is partisan and concerns will likely do very little to change the language or intent of the proposal. Third, contact your local representatives. An important rule to note: All politics are local. 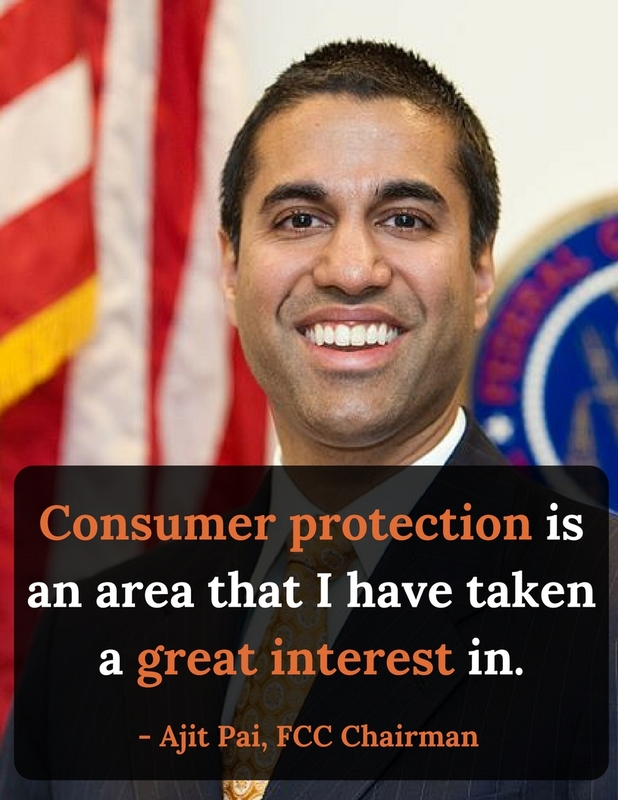 If you want to influence the power around the FCC, then voice your opinions to your local representative. This move won’t be easy so be fierce with your first amendment rights. The last time Net Neutrality was tested, Wikipedia blacked out content in protest. Thousands took to social media and blacked out their profile pictures. The Internet is an extremely important part of society. We should all want the internet to provide an equal performance, unfettered by corporate schemes to make an extra buck.